I was late and got lost a little yesterday but I still managed to catch the better part of the blogcon for the upcoming Family Congress 2012. I wanted to share yesterday about the time when I posted on FB about how parents who want to give the best to their children should attend marriage encounters, parenting seminars and maybe even nutrition counseling and regular therapy. That, instead of breaking backs to purchase expensive gadgets or doing thorough research on which school to send a child to or what enrichment classes in the summer are great. There were several negative reactions to that post, mostly about it being extreme and regular dates should do it. Regular dates with the hubby ARE important... but regular check ups are equally important. It's like the relationship's well-baby checkup. If we send our kids to different enrichment classes, why not attend one ourselves on how better to communicate with the members of the family, which food to prepare, how to affair-proof our marriage and the like? After all, nobody took up parenting and being a spouse in school, we usually learn as we go... and there is always room for improvement somewhere, even in the happiest of homes. Valle Verde Country Club in Pasig CIty. Registration Fee is inclusive of seminar fee, meals and maybe some freebies from sponsors. Breakout sessions include "Handling the Bully and the Bullied" by Dr. Honey Carandang and "Migrating and Managing the Digital World" by Ms. Queena Lee-Chua, PhD. 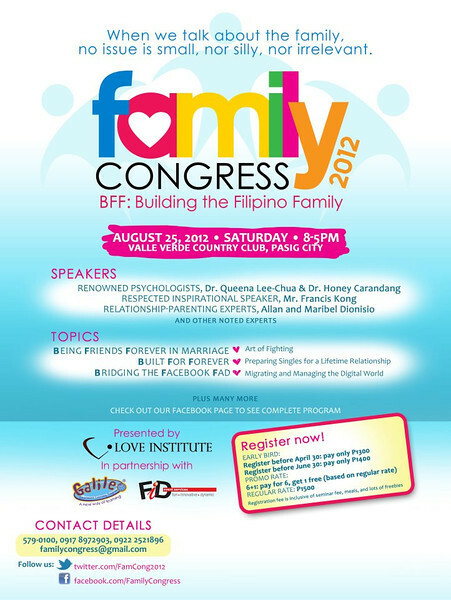 For more details please call 579-0100 and 4364-143 or mobile #0917-8972903 or email familycongress@gmail.com. Hi. 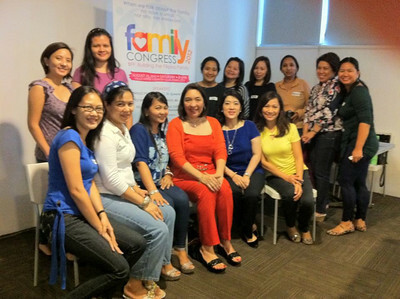 This is Fides, one of the organizers of Family Congress. Thank you for the post. I'd like to share the link to our Facebook page, but will it be possible for you to remove the sponsors as inclusion of the registration fee of P1500? The sponsors you mentioned were the sponsors for our bloggers meet. It's okay to mention them but not as an inclusion of the registration fee for August 25, 2012 event. Hope you can revise. Thanks!